In mixed-species condensates, atoms can form superfluids in pairs (above) or in antipairs (below) – equivalent to an atom of one species and a hole of the other – depending on quantum conditions. The simplest form of Bose-Einstein condensation occurs when a number of bosonic atoms (those with integer net spin) coalesce into the lowest possible energy state. Such condensates exhibit macrosopic quantum interference, persistent vortex currents and other manifestations of superfluidity. Another type of condensation occurs in fermionic atoms (each of which has half-integer net spin), which form pairs that then condense as bosons. This is the mechanism essentially responsible for superconductivity of electrons in metals and alloys. Theory also predicts novel forms of condensation in mixtures of two bosonic species, which have yet to be observed experimentally. If the interaction between species is attractive, they can form superfluid pairs consisting of one atom of each species. But if the interaction is repulsive, they can form “counterflow” superfluids of antipairs which consist of an atom of one species and a “hole” (or absence) of the other. 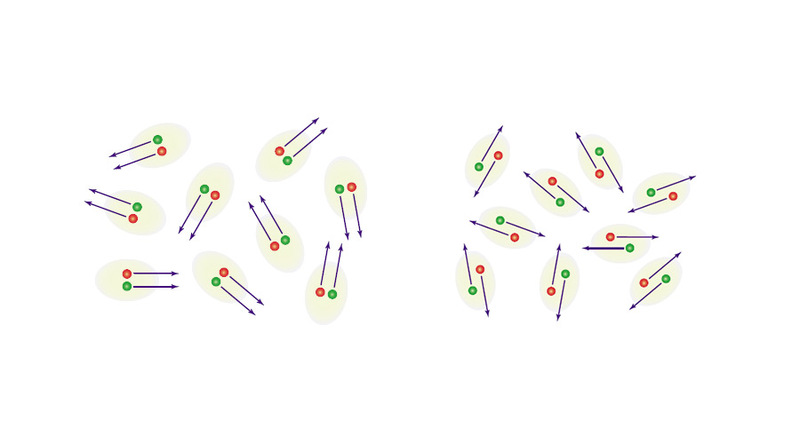 Now PFC theorists, using first-principles quantum many-body theory, have mapped out these pair and counterflow phases in one-dimensional mixtures. The results demonstrate that it is realistic to create these quantum phases in optical lattices, due to the ground-breaking achievements in ultra-cold atom technology. Moreover, they have described experimental protocols that should make it possible to detect both phases, using recently-developed techniques of momentum correlation spectroscopy.